Fall haute couture is now busting out, with glorious concoctions emerging like butterflies from their respective pupae. The usual suspects are amongst the display, however, a new and STELLAR addition is in the mix, yes, one of my all time personal favorites and a current obsession, ALBERTA FERRETTI! Technically, her collection is not "haute couture", but rather "demi-couture", which literally means "half custom made". This is an interesting concept I've only become acquainted with in the last several years, coinciding with my Chanel shenanigans. Lagerfeld has been playing with this clever twist for years, including a cadre of pieces in every collection that are technically pret-a-porter and off the rack so to speak, but are akin to haute couture in the attention to detail, the exquisite intricate Lesage embroidery, and bedazzled one of a kind tweeds, velvets, and silkens. Dolce & Gabbana, Alexander McQueen (Sarah Burton), and Mary Katrantzou have elevated their collections with such wondrous fare as well. You know it when you see it, check your pupils, they'll no doubt be dilated. 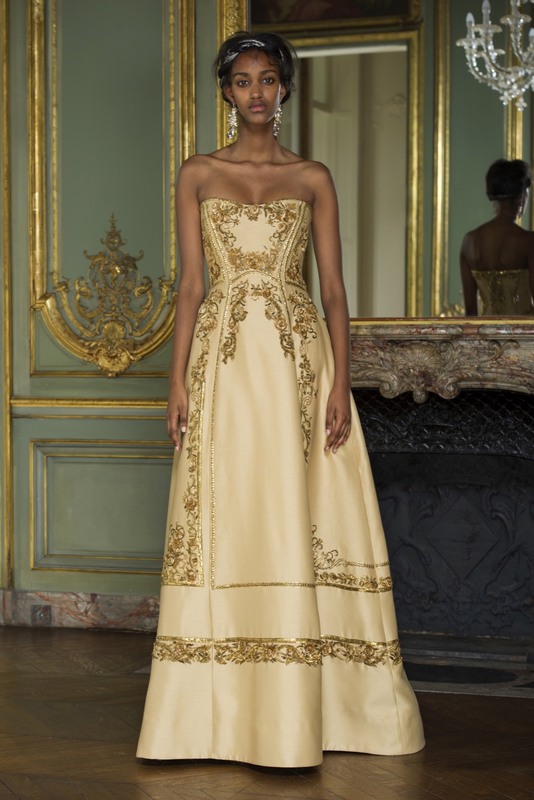 The requirements to be amongst the rarified ateliers producing haute couture are stringent indeed. These are hand made garments that require multiple fittings and might take THOUSANDS of hours to complete. And the price tag is commensurate, ascending into the hundreds of thousands of dollars. A Demi piece (which might take hundreds of hours for assembly) often gives the same bang for the considerably smaller buck and no need to hand over a major organ or fly to Paris for multiple fittings. Think 10-60K, rather than 500K, sort of the base camp of Everest. No need to bring an oxygen tank or billionaire with you into the fitting room. That being said, these items will NOT be relegated to the random racks, but will need to be a special order. Base camp ain't easy, but its more feasible than the summit! 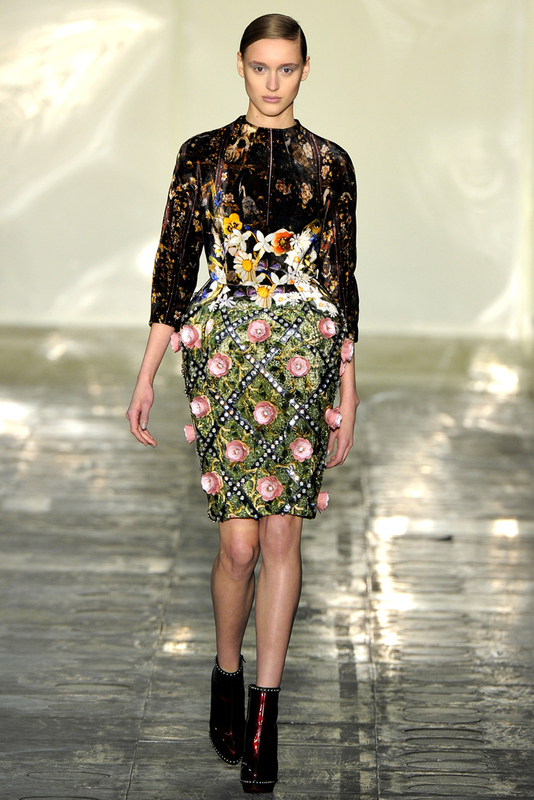 Some examples from Katrantzou, Chanel and McQueen. Recently Ferretti unveiled her new Paris showroom, in an 1860 townhouse, along the Rue du Faubourg Saint-Honore, and simultaneously introduced her new limited edition demi line, which will be priced 25-30% more than her signature line (hap tip WWD), remaining a less gruesome price point given the comps. 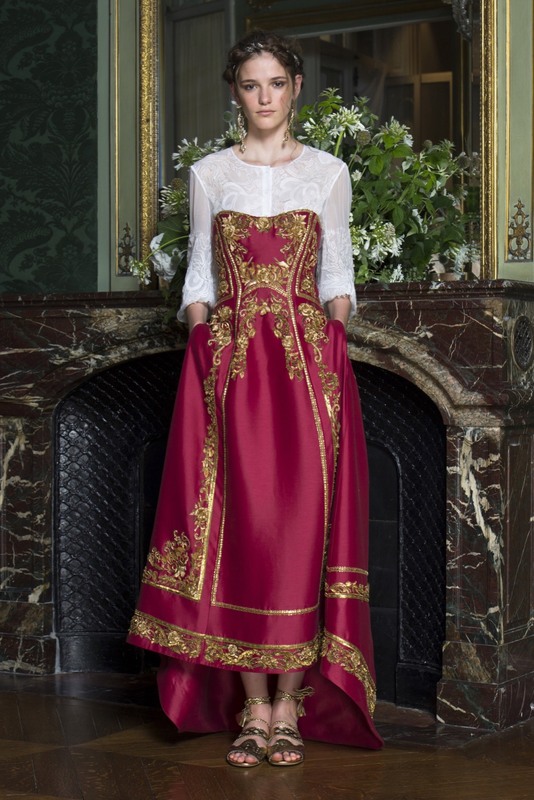 Whether you want to travel back in time to Camelot and channel Guinevere or just look like you were born in a palace, Ferretti captures the essence of days gone by without being contrived, fussy, or ostentatious. A winning creation stands alone without the need for a legion of face paint or baubles to "finish" the look. 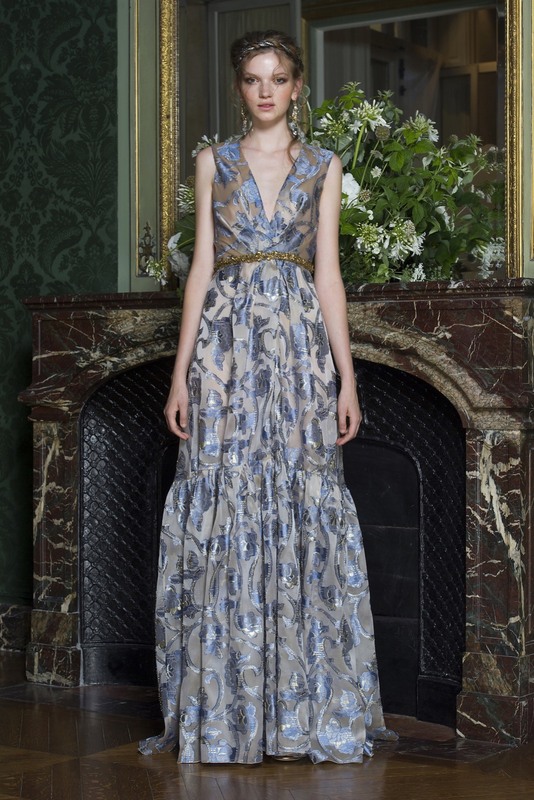 No one does lovely like La Ferretti, bringing a varied collection of frocks mixing airy and ethereal with royal and substantial. These are timeless treasures in friendly silhouettes that can be extricated from the vault for any grand affair. 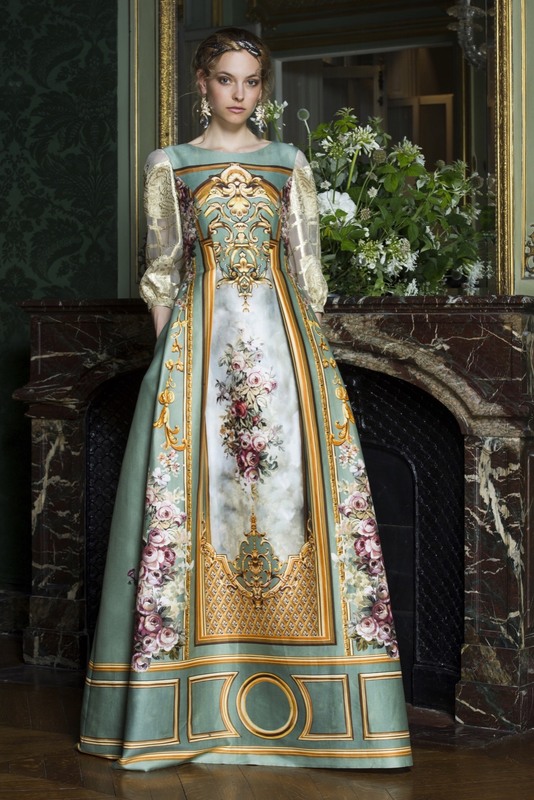 The floral bouquets and the silhouette conjure renaissance romanticism. A stunning option for those not enamored of overwrought opulence. Duchesse satin with hand embroidered brass beads, rife with regal splendor. Love that white shirt adjunct to the corset gown, just in case the temperature drops or the cleavage needs to stay under wraps. The fit and flare silhouette is a workhorse standard in the collections, a classic amongst cocktail fare. I for one am a fan of anything which accentuates the waist while camouflaging the derriere. For anyone on cleavage patrol go for the stunning red corset entry. Options for shoulder coverage include a cashmere bolero (Oscar de la Renta) or a pashmina shawl in a saturated teal or purple. 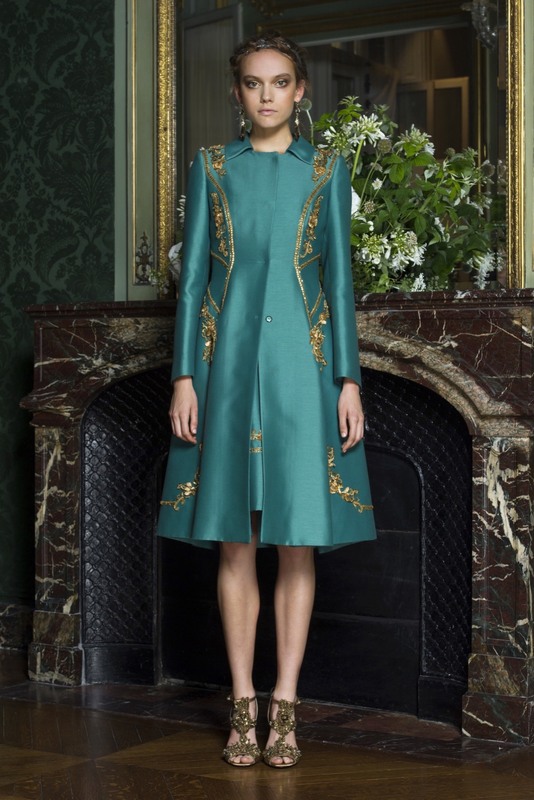 My pick of the lot, the teal jacket with just a hint of embellishment. 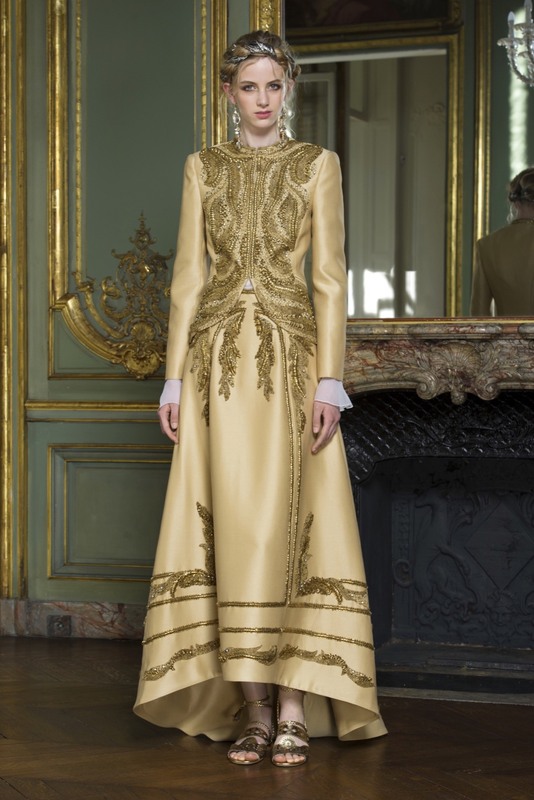 I'd wear it to the opening of the Opera and thereafter with skinny jeans and Chanel shoe booties. Shekels are precious these days, so if in doubt, always go for the versatile option, which usually is the jacket. These diaphanous beauties are made more delectable by virtue of their uncommon color palette of teal, cornflower blue (a whiff of a shade lighter than cerulean blue), and periwinkle. I say pair with gladiator sandals (de rigueur these days) and a garland of flowers atop the head! Devore lavendar velvet with a woven gold ribbon belt, sweet and lux. Hmmmm, both angelic and alluring. Find a groom pronto! I'd get married just for an excuse to be swathed in this mountain of tulle. Ferretti impresses once again with a brief yet stunning collection of impeccable options for any grand affair, fitting for a range of ages and sensibilities. Opening of the Opera, a meet and greet with a dignitary, or any red carpet hijinx one might consider, your demi will have you at least HALF covered!